Today, I am thrilled to be sharing our next big announcement. 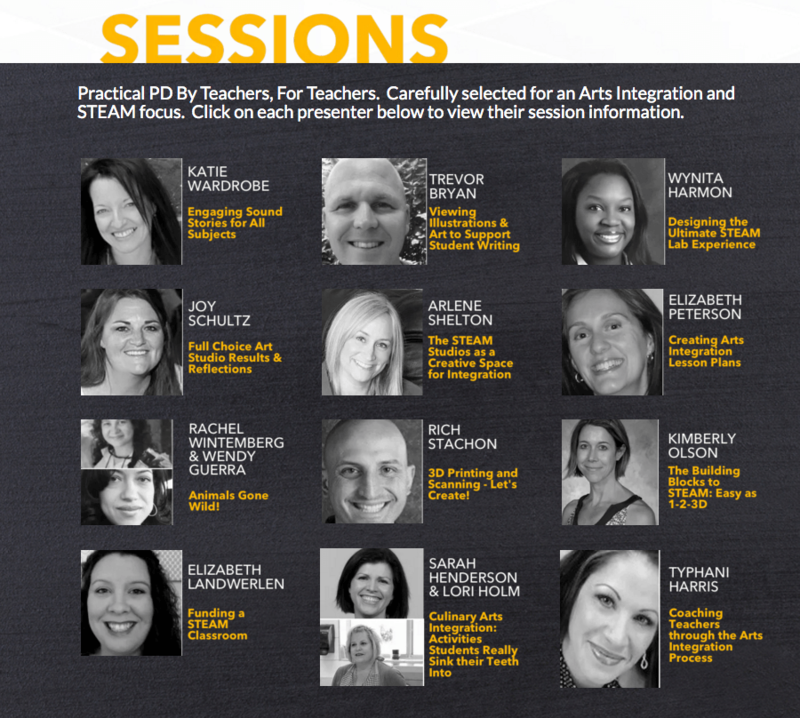 The 2016 Summer STEAM and Arts Integration Online Conference is now open for super early-bird registration! This event will take place on July 21st, 2016 from 10AM-4PM ET, and be available on-demand for a full year after the event. From now until April 30th, you’ll be able to grab a ticket to one of the hottest summer professional development opportunities for just $89. That’s a savings of $20 off the regular priced ticket. We’re doing something that has never been done before (I’m actually equally excited and nervous about this). It’s called an “Interactive Playground” and it will be held during the live conference day over lunch time. For the first time, you’ll have the opportunity to attend a LIVE make-and-take session with a select group of arts, technology, and museum organizations. This is INCLUDED in your registration! You’ll be able to choose from a selection of interactive sessions (they will be capped at 50 people each) and create a lesson or resource right along with everyone else in the virtual room during the lunch hour. You can chat with the presenter, ask questions, share your work and they will walk you through it step-by-step. Dr. Todd Whitaker has been fortunate to be able to blend his passion with his career. Recognized as a leading presenter in the field of education, he is the author of the national best-seller What Great Teachers Do Differently and The 10 Minute Inservice. Emma Scripps is the Program Designer for The Teachers Guild at IDEO where she runs design challenges and establishes the systems that support its scalable impact. She is fascinated by organizational change and movement building. Elle Luna works in her studio, where she paints, draws, and experiments. Prior to making art, Elle spent five years at IDEO where she worked across a variety of industries to develop multi-channel, holistic experiences with massive impact. She is the author of the wildly popular At the Crossroads of Should and Must. And of course, the hallmark for us are the amazing online conference sessions. Sessions that are shared for teachers, by teachers just like you. We’ll have over 20 sessions – both during the live day and in our breakouts area. Yes…you CAN get great PD from the comfort of home and still log the hours you need. You can attend the online conference either LIVE on July 21st or watch it On-Demand and get a 10 hour PD certificate for your participation. If you attend live, you’ll receive it at the end of the conference through a link on the screen. If you watch it all on-demand on your own time – you’ll just email us your reflections when you’re done. Then we’ll send you a PD certificate. See? Easy and flexible. Just like summer was meant to be. DONORS CHOOSE GRANTS ARE BACK! Need funds for that Arts Integration or STEAM project you’ve been dreaming about? All registrants for the conference are eligible to submit a Donor’s Choose project that supports arts integration or STEAM in their classroom. We’ll be selecting 3 projects to award up to a total of $5,000. So go ahead…dream BIG. You deserve this kind of innovative professional development – and I really hope you’ll be able to get in at the super early-bird pricing so you can save big. I am looking forward to welcoming you to this exciting event. Here’s to STEAMing forward this summer!